Halloween (Arcadia -- Alhambra), 1951. Caption slip reads: "Photographer: Richardson. Date: 1951-10-30. Reporter: Swaim. Assignment: Halloween, Arcadia -- Alhambra. 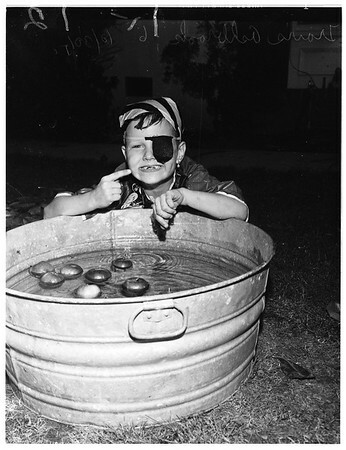 K10, 11, 12: Travis Ashbrook, 6, dressed as pirate, comes up for air to complain 'How can a man with no front teeth bob for apples?' K9: (get that) Travis Ashbrook tries to persuade dog, 'Twerp' to do his bobbing for him, since Travis has no front teeth. Travis lives at 1431 Cabellero road, Arcadia". Edits: "K19: L. to R.: Linda Swanson, Judy Wilson and Carolyn gibbs painting Halloween scene on bank window in Alhambra. Girls are Alhambra High students".